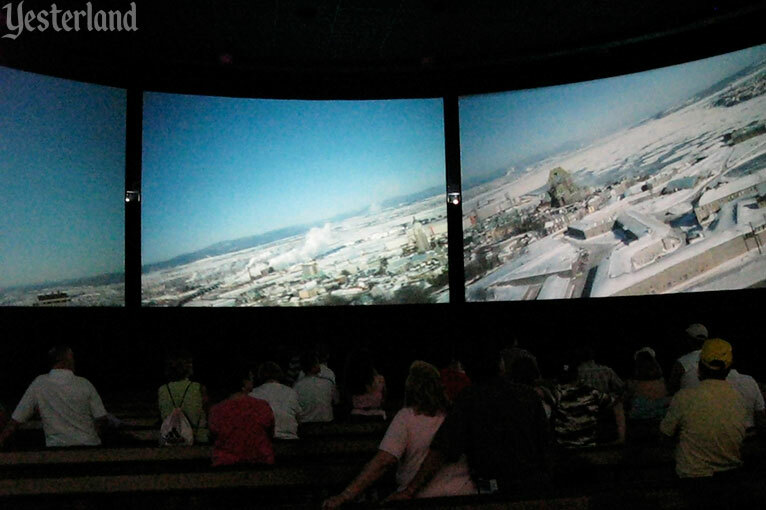 You’ve just stepped into the Circle-Vision 360 theater at the Canada Pavilion of Yestercot. 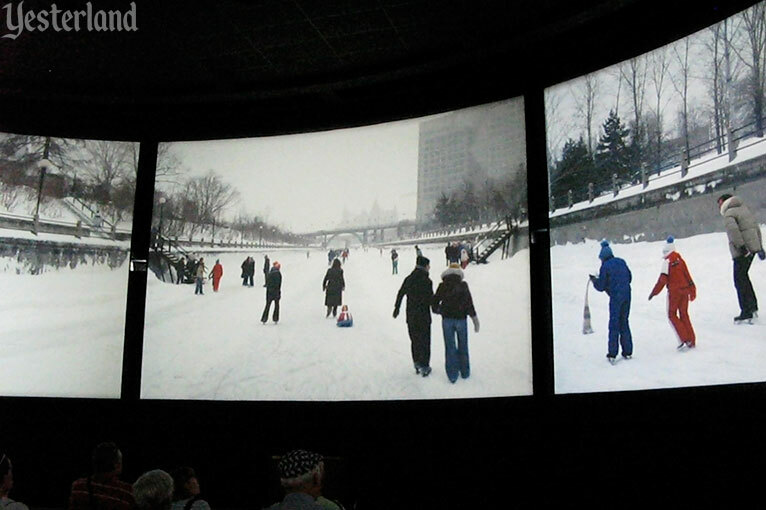 Soon the beauty, pageantry, ice, and snow of Canada will surround you on nine screens in O’ Canada! 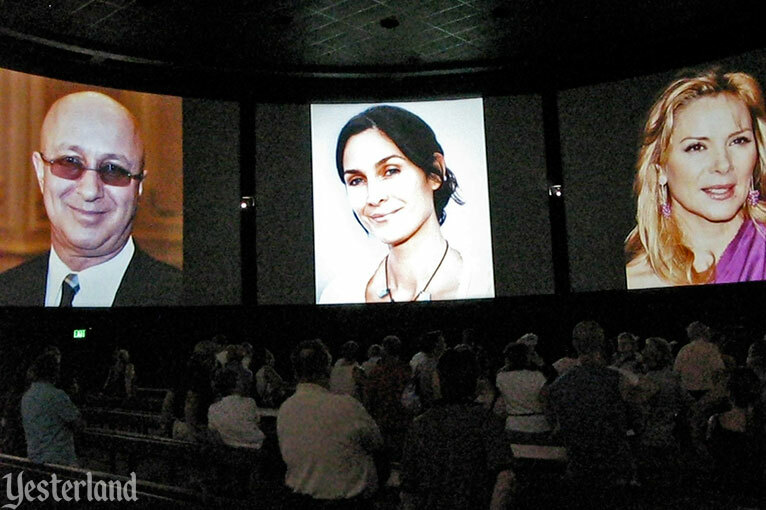 The show begins with a montage of photos on the front screen. “We bid you welcome” must be how Canadians welcome each other. 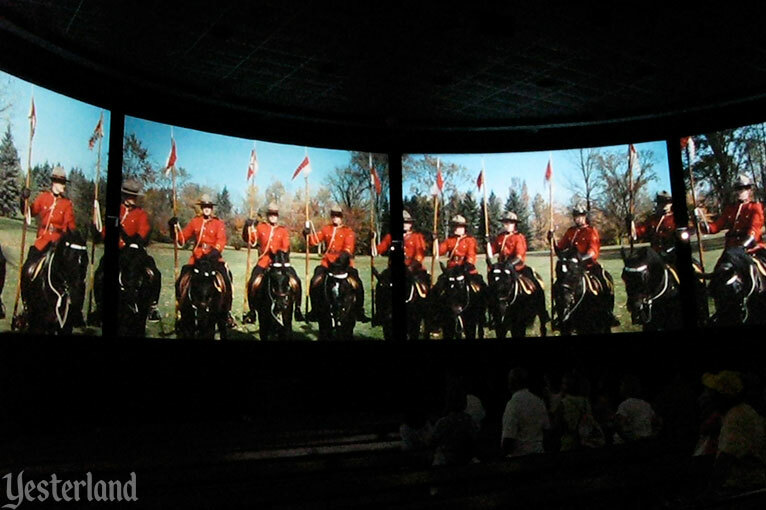 The center photo in the montage expands to fill all nine screens with Mounties on horseback. What could be more Canadian than that? The words all convey a sense of awe—but absolutely no sense of humor. The soundtrack also includes lush orchestral arrangements and rousing regional songs. Hold on to the handrail (but don’t sit on it). You might need it because the whole theater seems to tilt whenever the airplane on which the camera is mounted makes a banked turn. And don’t be like all those people around you who are just staring at the three front screens. After all, this is Circle-Vision 360. Look everywhere. 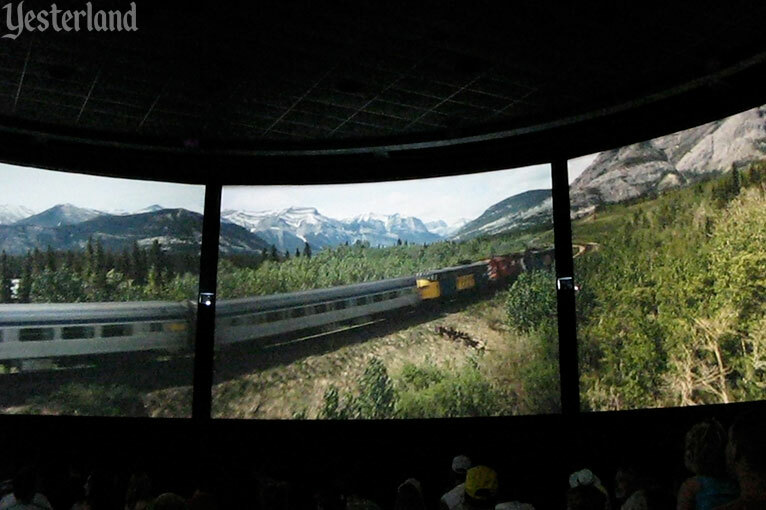 It’s now time for the song “Canada (You’re a Lifetime Journey),” written just for this movie, as the CircleVision camera flies, drives, and floats through breathtaking scenery. O’ Canada! 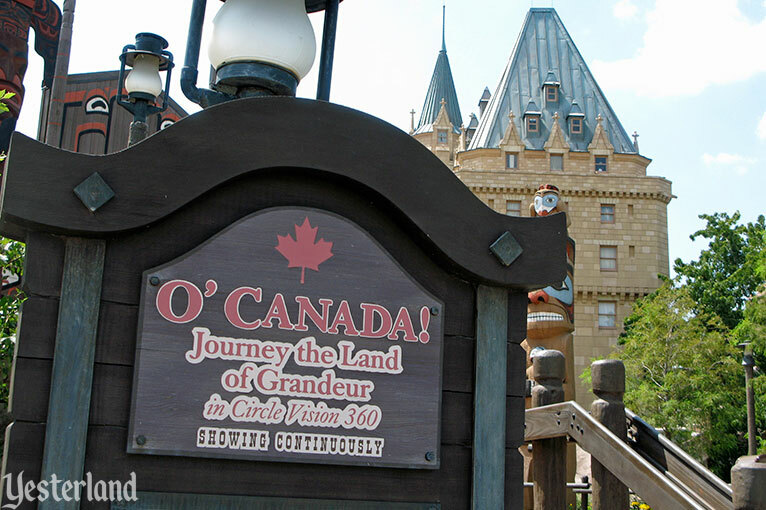 at the Canada Pavilion of World Showcase was an opening day attraction at Epcot Center on October 1, 1982. 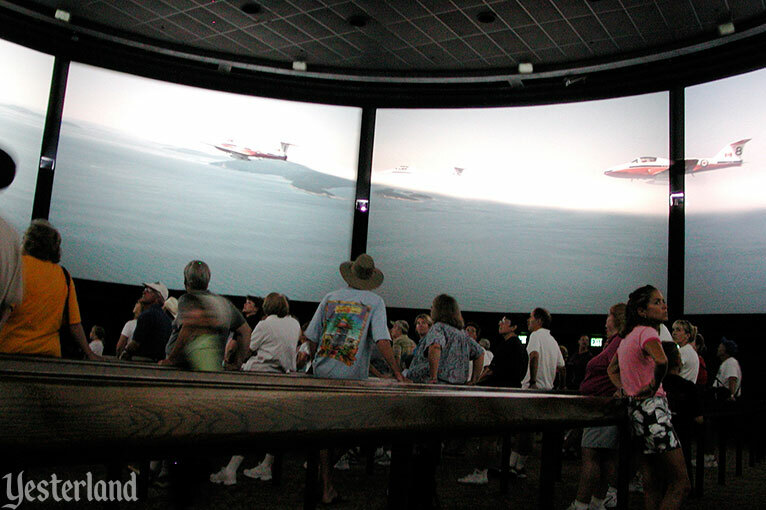 In those days, guests could experience three CircleVision 360 movies at Walt Disney World. At Epcot Center’s China Pavilion, an actor playing Li Bai, an ancient Chinese poet, narrated Wonders of China (1982-2003). The United States and the People’s Republic of China had just established diplomatic relations in 1979, and Wonders of China showed images that most viewers had never seen. In 2003, the movie was updated to become Reflections of China, still relying on the Li Bai concept. 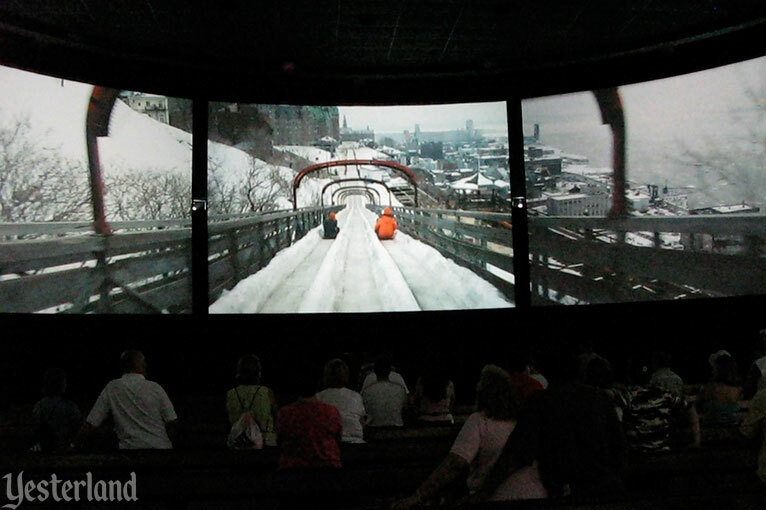 Over at Magic Kingdom Park, Magic Carpet ‘round the World (1974-1975 and 1979-1984) crammed a tour of “the four corners of the world” into 21 minutes. 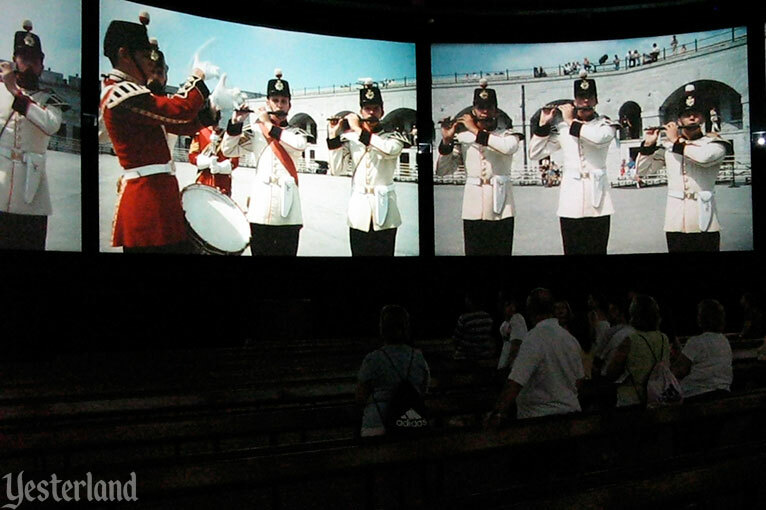 Although not a complete nine-screen Circle-Vision 360 movie, Impressions de France (1982-present) at the France Pavilion uses five screens in a sit-down theater for a partial wrap-around movie experience. Impressions de France shows timeless images of France accompanied by the music of Claude Debussy, Camille Saint-Saëns, and other French composers (with some original Buddy Baker compositions too). The movie has aged gracefully. 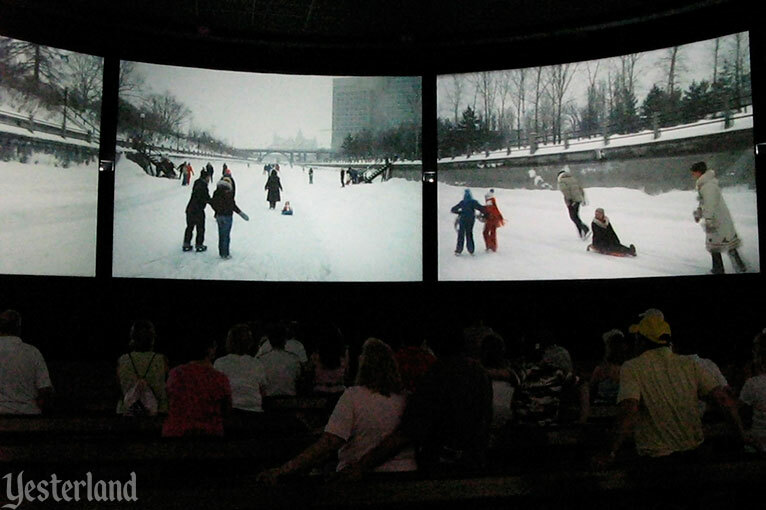 Many guests assumed the movies were sponsored by the national governments of the featured countries, given that Epcot Center was often described as a “permanent world’s fair.” In reality, the Canada and China Pavilions had neither government nor corporate participants, while the France Pavilion only had lessees for its retail and restaurant space. 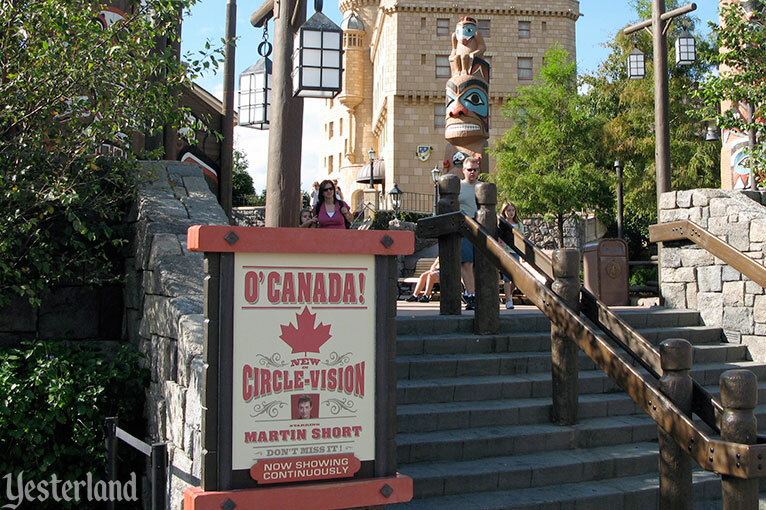 Compared to the other two World Showcase movies, O’ Canada! was the most traditional. With its old-fashioned narration and emphasis on formal pageantry, the movie came across as a product of the 1960s, not the 1980s. It seemed dated even when it premiered. In his Toronto Star column (“The Fixer”), reporter Jack Lakey normally deals with reader complaints about municipal services across Canada’s largest city. But on May 2, 2005, he dealt with something a thousand miles to the south. Lakey’s curiosity was piqued by a reader who complained that O’ Canada! was “embarrassing to Canadians and badly in need of updating,” so he looked into it. “We came. We watched. We cringed,” Lakey noted. 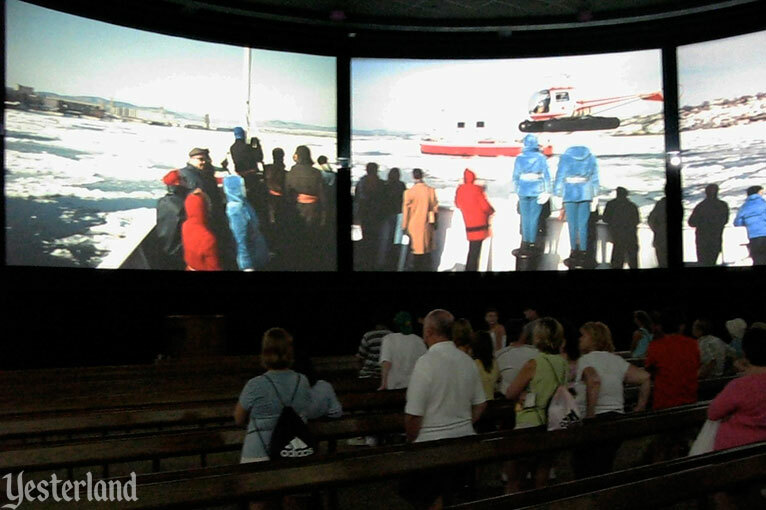 There’s a Mickey Mouse movie playing here at Walt Disney World’s Epcot Center, but it has nothing to do with the famous rodent. 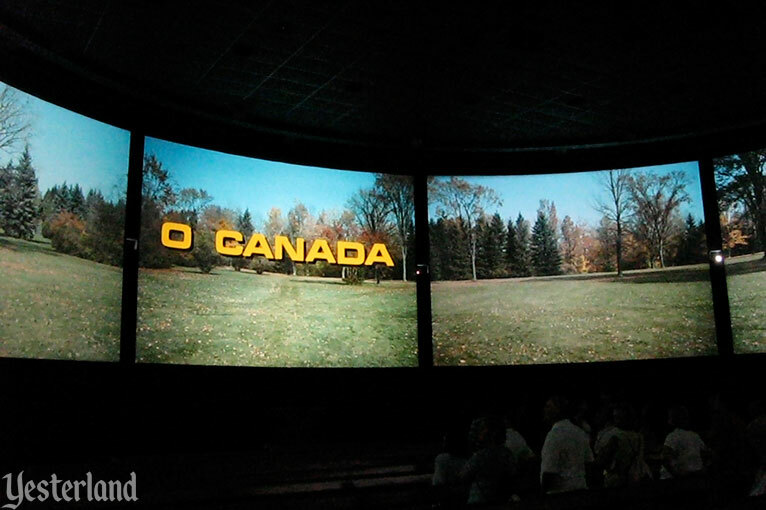 The film, entitled O’ Canada, is intended to feature the best of our country for visitors to Epcot’s Canada Pavilion. Toronto is kissed off in the 18-minute film in a matter of seconds, in an aerial shot of the skyline. It offers not a hint of the culture, diversity and sophistication of Canada’s largest city. 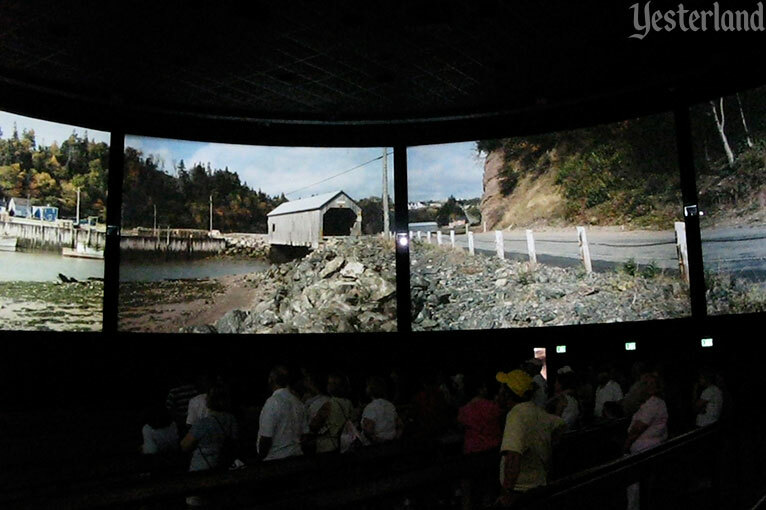 The movie plays in a circular theatre with nine overhead screens, called CircleVision 360. 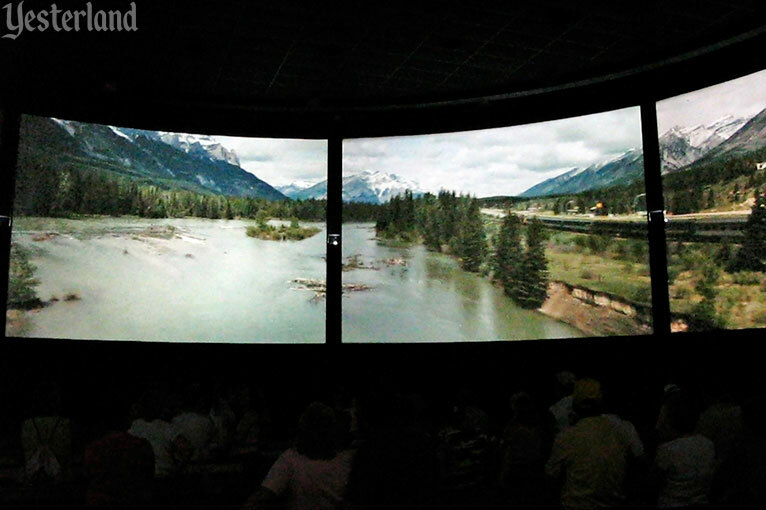 At points where timeless features such as wildlife or the Rocky Mountains are shown, the effect is spectacular. It moves on to herding caribou by helicopter, chuckwagon races, the Mounties’ Musical Ride and a marching highland pipe band. There’s a bobsled run, kids playing hockey and skaters on Ottawa’s Rideau Canal. During an aerial shot of Montreal, a narrator takes over. Her phony French accent is so forced and syrupy that some Canadians in a showing we attended were rolling their eyes. “I don’t think they could find any more clichés,” said Zach Schwartz of Niagara Falls, Ont. Disney called back to say it had partnered with the tourism commission and other tourism promoters, including Tourism Toronto and the Calgary Stampede, to make a new movie. Michele McKenzie, president of the commission, said it contributed about $500,000 to the production, while Tourism Toronto, the stampede and many other tourism groups from across the country kicked in $1 million more. The “new movie” turned out to be primarily footage from the old movie in a different order, with outdated sequences culled. 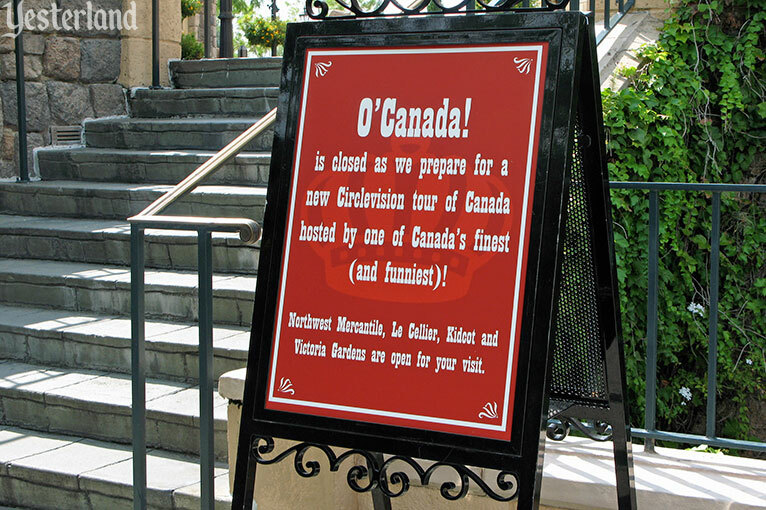 The movie would still be called O’ Canada!, but it would have a new script, a new attitude, a new narrator, and some new footage. 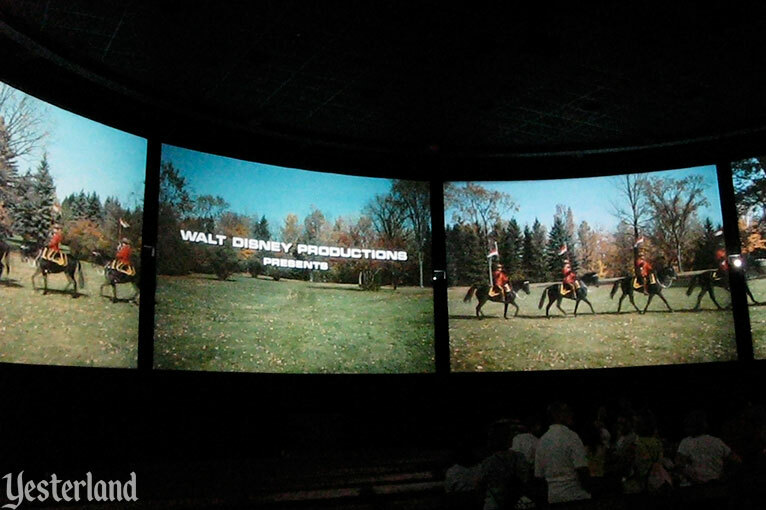 There’ll be no more cringing Canucks at Walt Disney World’s Epcot centre, with the unveiling of a new film that captures present-day Canada much better than its hokey predecessor. The O Canada! film that debuted here yesterday is everything the previous film was not – urbane, amusing, reflective of our culture and sophistication, and breathtaking, too, like Canada itself. It’s a world away from the 25-year-old film it replaced, which managed to invoke just about every cliché imaginable and left many Canadians who saw it red-faced with embarrassment. The film also has good music and a clever tour guide – in this case actor Martin Short, who steals the 14-minute movie with witty narration and sight gags – and 2006 Canadian Idol winner Eva Avila, who sings an original song written for the movie. But it’s all in the presentation and spin, and the artfully scripted film, featuring Short’s expressive face and natural affinity with all things Canadian, is at least as entertaining as it is educational. Undoubtedly, Lakey was proud of his own role in getting the movie updated. The new movie begins with a blizzard surrounding the audience on all nine screens. A formal off-screen narrator intones, “Canada. Big, wide and very, very cold. Here in the Great White North, it snows 24 hours a day, every day of the year.” A tropically attired Martin Short is appalled by the misinformation. He tries to interrupt as the narrator continues, “Its frozen landscape is dotted with igloos, homes for the vast majority of the natives. Penguins and polar bears prowl the permafrost…” Eventually, Short wins and takes over. Short is on one screen. Random snow is on the other eight. This scene is the first indication that much of the new footage was filmed without using Circle-Vision camera equipment. Putting a different image on each of the nine screens can be effective. Having all screens black except for a single one can help tell a story. However, in the added O’ Canada! scenes, the repeated lack of true Circle-Vision comes across as a cost-cutting move, not as intentional creativity. 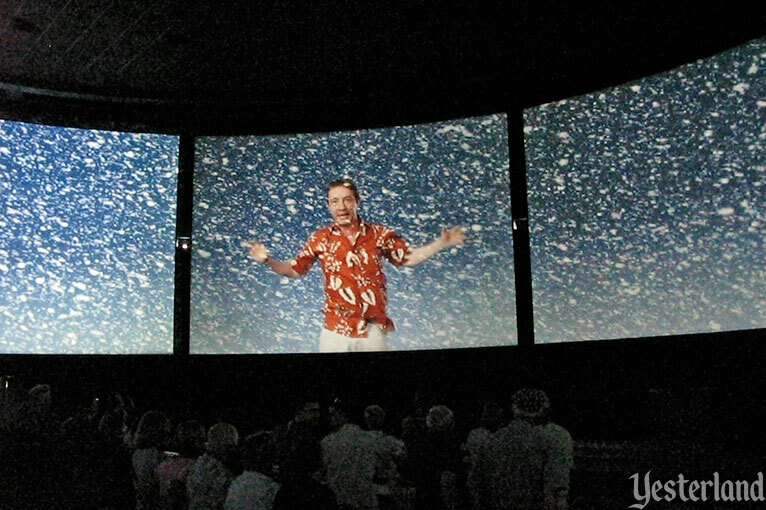 Even the new Calgary Stampede sequence, which would have been great in true Circle-Vision, simply repeats the same action on nine screens and then cuts to Martin Short on a single screen. 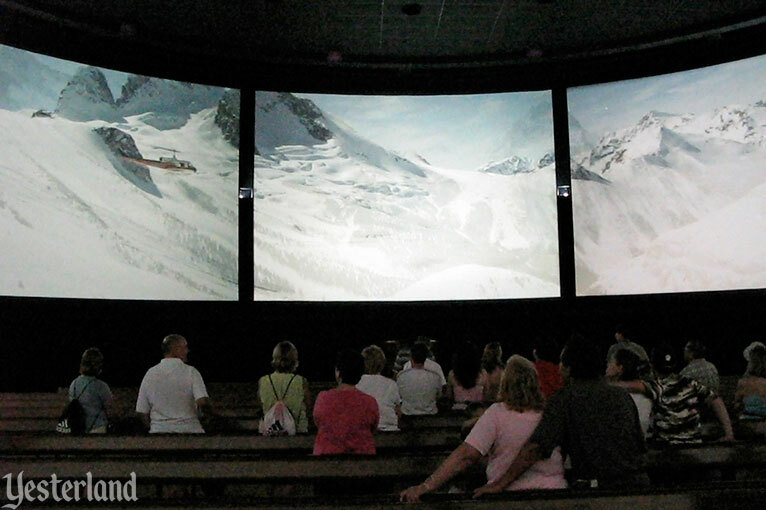 Fortunately, Disney did not keep the Circle-Vision equipment in mothballs entirely. 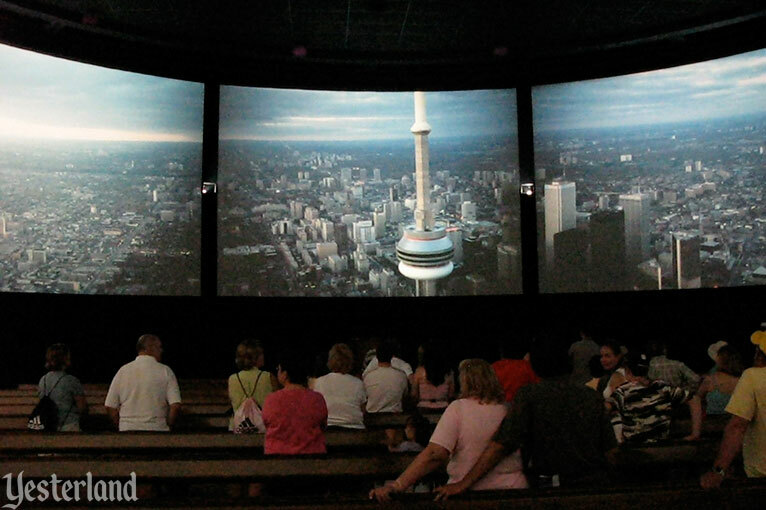 The movie added 360-degree aerial footage of Canadian city skylines and Niagara Falls. 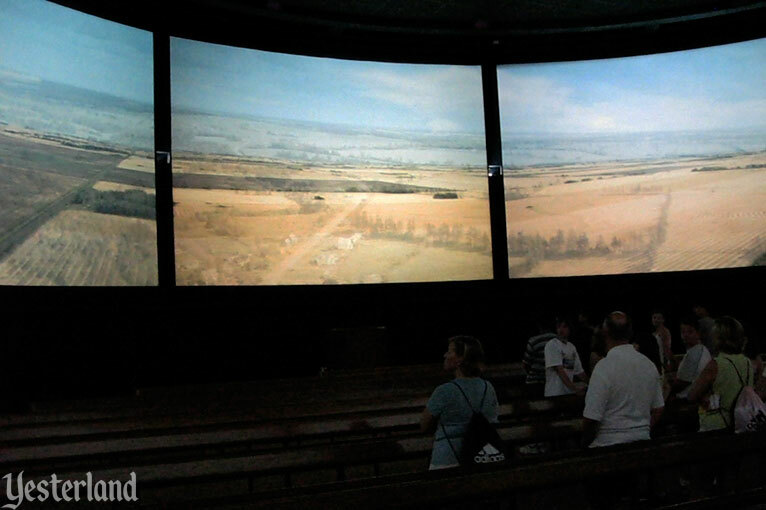 Most of the 360-degree scenes in the updated movie were also in the original. It’s not as if all clichés have been eliminated either. 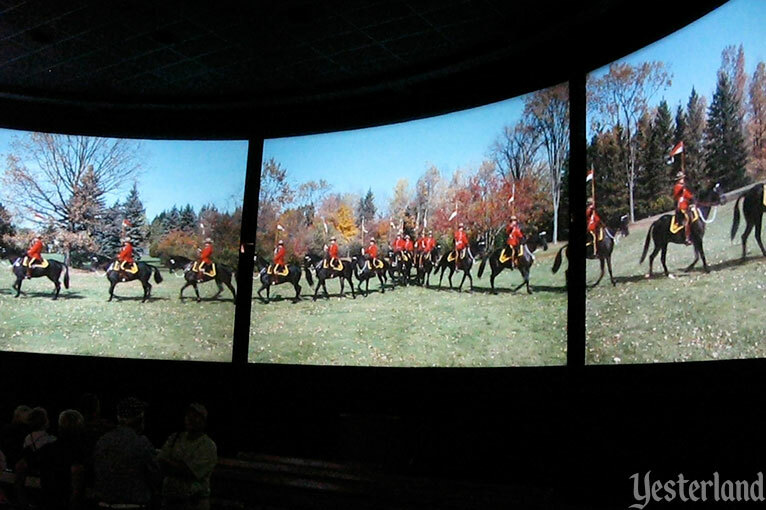 Even the Royal Canadian Mounted Police riders who were under the opening credits of the original O’ Canada! are back, only without credits over them. You apparently can’t show Canada without showing Mounties.